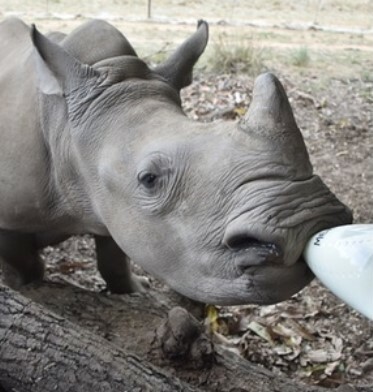 Baby Rhino Meha at Baby Rhino Rescue | Adopt and Donate Now! Meha was witness to the poaching of her mother in the Kruger National Park, south of the Phabeni gate. A young rhino, she was confused, traumatized and did not leave her dead mother’s side. She was alone and without milk for 72 hours. When the Kruger Park rangers found her, she was immediately put into a helicopter with head ranger, Don English, and flown to Care for Wild Africa. She arrived in April 2016. Like many of the calves that come in, Meha was severely dehydrated and in deep shock. She had no wounds though, so once she was hydrated, it was relatively easy to transition her into a new life. She took to drinking her milk from a bottle and was introduced to her new family: Venus and Manji. She shares a boma with these young rhinos and the three are firm family. Manji and Meha have a specially strong bond now. She is a feisty young rhino with a lot of verve and energy. When she is bottle-fed, the volunteers have to get out of the way fast, because she can be aggressive. She is in very good spirits, and enjoys the freedom of the big boma, with access all day to the lovely green fields close by. The grass is thick and green and the shade of the mango trees is deep. She loves to lie side by side with Manji and Venus when the sun is hot.